I spent two summers living with my grandfather, spending all my free time sinking easy solitary baskets. During the second summer my grandfather had to use an oxygen machine to breathe. The following summer he sold the house and moved into an old folks’ home. The summer after that he died. The day before he died I had my first day of work at a fast food place called Art and Ollie’s Hot Dogs. Before the lunch rush I got trained on how to use a wall-mounted metal press to slice potatoes into would-be French fries. The guy who was training me told me it was his 30th birthday. He had thick glasses and seemed miserable. “I get my anger out using this thing,” he muttered. He yanked down on the lever and finger-sized slices of potato came out the bottom and thunked into a steel bowl. Meanwhile, there are just a few ticks left on the clock. The home team is down by one point. The Basketball Kid breaks free of the scrum of bodies at midcourt and catches his teammate’s inbounds pass. As he catches the pass he is moving in the direction of the wrong basket, and he considers continuing in that direction and laying in a victory-sealing basket for the other team. He considers it like a weary commuter might entertain thoughts of falling in front of an oncoming train. So easy to end the monotony, the commuter might think. To be or not to be, wonders The Basketball Kid. After I watched the birthday man fill a few metal bowls with sliced potatoes, I was placed at the counter. My job was to take customer orders and call them out to the owner, Art, who was manning the grill. But I couldn’t do it. I couldn’t raise my voice to call out those words. The place kept getting more and more crowded. I couldn’t sleep the night after my first day at Art and Ollie’s. I was filled with dread at the prospect of having to shout food the next day. I don’t remember, but it’s possible I even prayed for something to happen to save me from going back in there. When I got the news in the morning that my grandfather had died, relief was among my emotions. “Hey, I’m sorry,” Art said. What else could he say? The whole scenario worked so well that I killed my grandfather all over again a couple years later to blamelessly quit a job loading trucks for UPS. Triumph? The Basketball Kid turns and faces up-court. He can see a path. He can see the whole moment of triumph before it unfolds. He will dribble left past a pick to lose his defender, spin to lose the man shifting over to guard him on the switch, drive the lane and take flight. But he doesn’t move. He holds the ball. He cradles it. Time is running out. For years after he died I dreamt about my grandfather. He kept getting older and older in the dreams. He kept seeming more and more stunned by life, his eyes wide, his lips moving as if he had something to tell me but couldn’t quite get it out. I had to help him walk, his body leaning into mine. I woke with the feeling of the weight of his flesh still dissolving from my own. Then I’d get up and go into some transitory job because by then I had become able to shout hamburger and hot dog as loud as necessary, so to speak. I mean whatever it was inside me that held me back from being some guy yelling the word hamburger had gotten dulled. If necessary, I could be the shithead yelling hamburger; I could work. By now I’m almost a decade older than the guy I’d pitied for spending his birthday angrily slicing potatoes. I’ve spent many a birthday doing the same, more or less. Anyway I wish I still had my grandfather’s pine-tree basketball rim nearby. It’s a wish I often have. To kill the slow hours. To pretend there are an endless supply of hours to kill. To dream The Basketball Kid. But The Basketball Kid is sick of being dreamed. He holds the ball. The crowd looks on, their eyes as wide as those of the stunned purgatorial ghost of my grandfather. They try to shout but no sounds come out. The Basketball Kid gently lays the ball on the varnished wood floor and walks toward the exit. He is outside in the cold when the buzzer sounds, affirming defeat. 1. Your words ring very true. The line about killing your grandfather all over again is brilliant. 3. 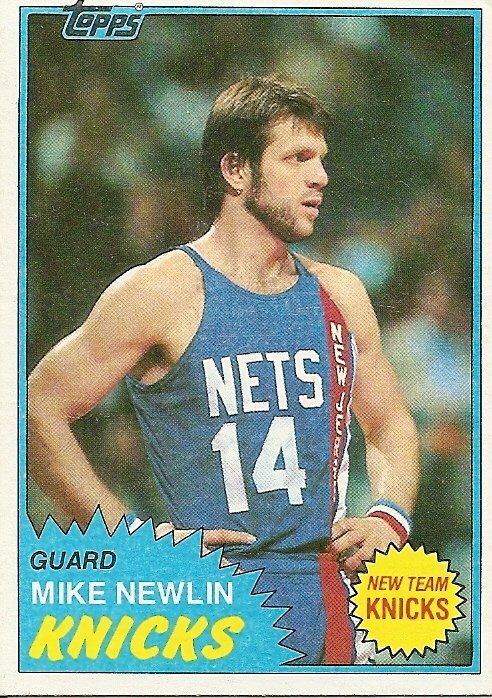 For those who do like basketball, does anyone here remember Mike Newlin? He once poured in 52 points against the Bird-Cowens ’79-’80 Celtics. Two seasons after he left his first team, the Rockets, they made it to the finals, and as soon as he left the Nets they went from putrid to pretty good (and the team he left the Nets for, the Knicks, instantly went from pretty good to putrid). Also, there’ve been some comments trickling in for old posts over the last couple weeks, including a question (as yet unanswered) about the intactness or lack thereof of one or another of Sixto Lezcano’s feet (see Sixto’s profile under Milwaukee Brewers). There are also new comments for Bob Welch (Dodgers) and for Father & Son (Behold the Unsortable). 4. I always wondered how a 30-year old man who makes french fries for a living gets up and goes to work each day. He must have something really special going on in his life when he’s not making french fries. Frying ain’t much of a way to make a living, son. 5. I vaguely remember Newlin. I was a huge ABA fan, and in particular a NY Nets and a Dr. J fan. I followed the Nets for a couple of years after the merger even after all the wind went out of my sails with the Dr. J trade. 6. 5 : In a way, Newlin’s exit brought to a close the aimless post-ABA years and ushered in a brief hopeful phase for the Nets: with Sugar Ray Richardson and Sugar Ray Williams in the backcourt and Albert King and Buck Williams at the forward spots, they were young and talented and on the rise. But then Albert never really got as good as people thought he’d be and the Sugar Rays self-destructed. The Nets first post-ABA title still eludes them. Some call it the curse of Dr. J, but I prefer to think of Billy “The Whopper” Paultz as being the source of any and all Nets curses. 7. Back when Sports Illustrated and The Sporting News were the only sources for national sports news (if you didn’t have that new-fangled cable teevee), I had a subscription to the former and my best friend the latter. We were easy to shop for that way, and we bartered the new issues back and forth until the data was permanently imprinted on our frontal lobes. Ah, the blissful ease of childhood concentration; I miss it so. He left Houston just before they broke through as a playoff power. The Nets got him for next to nothing (John Stroud? ), and then flipped him to NY for Mike Woodson. The NBA in those days still had that “hey, are we going to make payroll this month?” feeling to them. Offense was still pretty and often involved more than one player, and your guards didn’t have to be cornerbacks to lay good defense on opponents. We had season tickets for the Nuggets in their last ABA season and first NBA season, then we moved to Oregon and were swept up in the Blazers/Supes teams of the late 1970s. As a big college hoops fan, I was as happy to see Magic and Bird play for pay as the next guy, but those were still glorious times without them. I didn’t have those cardboard gods of hoops, Josh, I just loved the game. I wonder when the NBA jumped the shark for me…? Has it for others? 8. 7 I know it will be viewed as heresy as some, but to me, the NBA jumped the shark when Michael Jordan unretired a third time and played for the Wizards. I was pretty excited to watch the NBA when Shaq, Kobe and Phil Jackson found their groove, but it double-jumped the shark when Karl Malone and Gary Paton joined them and fell short of the NBA title. Perhaps it is a far-too LA-Laker centric view of the NBA, but when you grow up during Magic’s Showtime era, everything pales in comparison. 9. 7 : Wow, season tickets for the ABA Nuggets. I wonder if you were able to see Skywalker Thompson face off against the Doctor in the End Times finals of 1976. Erving’s play in that series was described by many who were there as the greatest basketball performance in the history of the universe. The ABA all-star game was also in Denver in ’76, where the Doctor won the dunk contest with his launch from the free-throw-line. As for Jumping the Shark: well, I won’t go that far. I’m still a fan, but not like I used to be. There was a time when pro hoops moved up to almost equal status to baseball for me, and that’s not so anymore. I still think it can be a thing of beauty (look at the Suns), but I won’t ever care as much as I did when Larry Bird carried my vicarious hopes and dreams on his sloping shoulders. I just watched the Larry Bird/Small Town video again (http://www.youtube.com/watch?v=rlaAEvYvl5o&feature=related), as I am wont to do, and it makes me realize that hoops was actually bigger than baseball for me for a while. There’s no baseball player from my childhood that I miss seeing play as much as I miss seeing Larry doing his thing. He and Magic took b-ball to the level of art, a level it had never reached before and hasn’t reached since. The highlights are still out there on the youtube, for those interested in searching, and don’t stop with The Dunk Contest. David Thompson was no Julius Erving, but for a brief professional moment, he soared higher than Doc, Connie Hawkins, or Jordan ever did. Unconfirmed is the story of Skywalker scooping silver dollars off the top of the backboard, but no one who saw him doubts that he could have. He flamed out for all the reasons you might suspect could bring down young millionaires in the late 1970s, and he never saw the Nuggets under Doug Moe bring the true ABA spirit to the NBA (even if that team never won anything important). Those were the days, my friends. 11. 10 : My favorite poster on my wall in childhood was the one of a skying David Thompson. He did get a to play for Moe for a little while, averaging 25 ppg for the Nuggets the year Moe took over as head coach in midseason (’80-’81) then chipped in 15 ppg for the ’81-’82 English-Vandeweghe-Issel team. Mike Newlin always looked scary to me as a kid. To me, he resembled the caveman in the comic strip “Alley Oop”, which used to scare me.